*Spoiler warning: This review contains full spoilers for both the premiere episode of Star Wars Rebels, “Spark of Rebellion,” and John Jackson Miller’s A New Dawn. After months of previews and discussion, Rebels is finally here and Dave Filoni, Simon Kinberg, Greg Weisman and company have given us an addition to the Star Wars canon that looks and sounds amazing. While not nearly as hyper-stylized as The Clone Wars, Star Wars Rebels does have an approach of its own that employs not only imagery based on Ralph McQuarrie’s designs for the original Star Wars, but also a crisp animation technique and smooth lines reminiscent of the Disney animated features Tangled and Frozen. 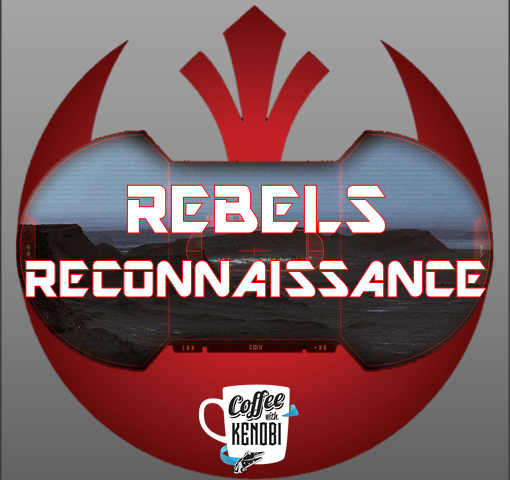 Full of Original Trilogy music cues that harken back to scenes from those films, Rebels’ first episode, “Spark of Rebellion,” succeeds in reminding us what we loved about the original Star Wars while also feeling like a natural extension of the larger saga. And while there were certainly Prequel Trilogy and The Clone Wars references as well (i.e., James Arnold Taylor as Obi-Wan Kenobi sending out the warning to the Jedi after Order 66), to this point the producers of Rebels seem to be focusing on recapturing the hearts and minds of Original Trilogy fans. As the show evolves and continues to tell stories that take place between Episodes III and IV, it seems to easy to imagine Rebels truly becoming a bridge to unite fans of both (so far) eras of Star Wars. It is in the heart of this volatile environment that we first meet Ezra, our surrogate eyes and ears for this corner of the Star Wars universe. He is a solitary figure at the beginning, used to surviving on his own and not adverse to bending the rules in order to make his way in the universe. He see him steal twice in the first few minutes, but there is a kind of swagger to him as well that is instantly appealing. Not quite a Han Solo nor a Luke Skywalker analogue, Ezra is something new but yet also seems destined to follow his own Campbellian Hero’s Journey. He is a Force-sensitive and therefore a potential Jedi, and this latent ability combined with determination and apparent fearlessness make him an excellent candidate to help Kanan return to his Jedi roots and realize his own true potential as a hero. The two should make for intriguing foils going forward as Ezra is in many ways a younger version of Kanan. In A New Dawn, we learned that Kanan’s earlier years between the Jedi Purge and the events of “Spark of Rebellion” were spent in a nomadic pattern of running from his true self and attempting to keep from making attachments he felt sure to lose. We also learned that Kanan is not his true name, but rather it is Caleb Dume–a surname rather fitting for a Jedi born shortly before the events of Order 66. We talked a lot about the significance of names in Star Wars on Rebels Reactions #3 and it seems that our theories about the name “Kanan” being a potential reference to the Biblical promised land of Canaan might be correct–especially when one also takes into account that the Biblical figure of Caleb features prominently in the story of the Hebrews entering and conquering the aforementioned promised land. The name “Ezra” has Biblical connections as well inasmuch as an Old Testament man by that name was instrumental in leading a group of Judean exiles back from Babylon to Jerusalem. So in effect, it appears that we are seeing two characters whose names link them directly to Biblical stories of long-awaited rescue and restoration play a large part in fighting for freedom from the grip of the Empire. I would be remiss if I went any further in this review without mentioning Hera Syndulla, another character whose name is tied to legend–this time to a Greek goddess and mother of gods herself. In “Spark,” Hera becomes something of a mother figure to Ezra and is instrumental in convincing Kanan to include the boy in the crew of the Ghost. We do not know yet if she is related to Cham Syndulla (from The Clone Wars), but from A New Dawn we do know she has been at this rebellion thing for a while and that she needed some convincing to include Kanan initially. The relationship between these two has certainly evolved since then, and even though Kanan has supplanted her as leader, the two are extremely close and Hera has been let in on the secret that Kanan is a Jedi. Her early rebuffs of Kanan’s romantic advances seen in A New Dawn seem to have been dropped in favor of acceptance and reciprocation. We saw a bit of this in the short “The Machine in the Ghost” and in “Spark of Rebellion,” she calls him “Love” at one point, but it’s unclear how much of Rebels will focus on this dynamic. What is clear is that Hera believes in her cause and believes in people, and her influence on Ezra is certainly one of the causes of the latter’s heroic actions during the Wookiee rescue on Kessel at the end of the episode. On top of that, Hera is an amazing pilot, loyal friend and the moral compass for this ragtag group. Rounding out the organics in this crew, Zeb and Sabine provide humor, menace and style in “Spark of the Rebellion.” We don’t know a lot about either of these characters yet, and they were not a part of A New Dawn either, but their interactions with Ezra help drive the story in this first episode. From the beginning, Zeb is annoyed with Ezra and continually makes cracks about “ending” him, but when Zeb chooses to give the boy up to the Imperials rather than risk being captured himself, it’s clear that the former member of the Lasan Honor Guard is filled with regret. When Ezra is rescued later on, Zeb reverts to teasing him again, but this time in a more big-brotherly way. Even so, Ezra does not seem ready to forgive quite yet and their relationship is still need of repair. The remaining friction is a definite sign that Rebels isn’t just a kid’s show and the continuing evolution of the Zeb/Ezra dynamic will be fun to watch. Another dynamic that is already fun to watch is that between Ezra and Sabine. It’s an amusing reveal when the young Mandalorian removes her helmet and Ezra sees her face for the first time. He’s clearly smitten and changes his whole attitude toward her. Still, she’s out of his league and Sabine lets him know that quickly a bit later on when she states that her reason for keeping him aboard the Ghost is that he “knows too much.” Ezra is clearly disappointed that her reason isn’t more personal, but he bounces back pretty quickly. In any case, Sabine’s plenty busy already being the resident artist/demolitions expert of the group who seems to enjoy the colors of her explosions almost more than the damage they cause. To this point, we know very little of her back-story, but I’m hopeful that we’ll get more details soon. One thing for sure is that the crew of the Ghost is a tight-knit and experienced group and even Chopper (the feisty astromech and last member of the Ghost crew) knows his role and pulls his weight. Watching Ezra find his place in Kanan’s crew as they continue to wreak havoc on Imperial operations will be fascinating to watch. Unfortunately, our heroes’ acts of guerrilla warfare have already garnered the attention of Agent Kallus of the ISB (Imperial Security Bureau). Like Count Vidian in A New Dawn, Kallus is a truly formidable opponent for our heroes and quickly makes his mark as a memorable villain in the Star Wars universe. He is calculating, brave, and exudes leadership. You’d almost root for him except that he’s an Imperial. But the real genius of Kallus being a legitimate threat is that if he can’t handle the rebels he encounters, there’s someone even worse–the Inquisitor. The Pau’an Dark Side user makes only a holographic appearance in “Spark of Rebellion,” but the menace he invokes is palatable. Throughout the events of the episode, Agent Kallus has proven that he can handle almost anything, and even seems a step ahead of our heroes at times. In fact, his call to the Inquisitor comes only after Kanan finally reveals himself to be a Jedi. The sequence in which this occurs blends a slow-building Force theme with an almost complete suspension of the action to create a true goosebump-inducing moment. “Spark of Rebellion” concludes with Ezra being presented a choice to learn from Kanan and become a Jedi himself. This call is to an adventure that will be filled with both danger and excitement. Ezra accepts quickly, and I believe Star Wars fans old and new will be just as eager to follow him and the crew of the Ghost on their weekly escapades in a galaxy far, far away. Spark is a wonderful start to a new era. It was everything I hoped it would be in a Star Wars experience. Great review!! Even in the limited screen time we have of him I really think I’m going to be a fan of Agent Kallus. He doesn’t seem like a typical Imperial. Excellent blending of the mini movie (as I like to call it) and the novel, Craig. 🙂 You warned about spoilers, and I was concerned about reading your blog just yet because I am only halfway through “A New Dawn”. However, I plunged ahead anyway. Luckily, you did not give away too much of the plot (at least nothing that I already didn’t know 😉 ). The two works of art certainly play off each other very well, and you presented them together in a cohesive, well-thought out way. 🙂 Thank you! I am so excited about this new era of Star Wars! It’s obvious you are, too. 🙂 I can’t wait to read what you have in store for us next!